Yeah, we didn't know either. Overlooking the city of Napa is Mt George. And just on the other side of Mt George is the Suisun Valley. Now you know. Turns out that growers have been harvesting grapes there since the 1800's. Today there are a couple of dozen wineries there competing for their share of the limelight - which is tough when your next door neighbor is flashy Napa. And so you sound like you know more than you do, the pronunciation of Suisun is something like s'SOON. 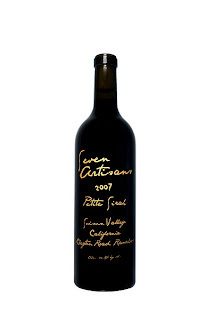 This wine, one the Artisan Family of Wines' inaugural releases, is our first introduction to Suisun Valley wine. And it's an eye-catcher. Packaged handsomely in a substantial black bottle with gold painted lettering, it looks expensive. Inside the bottle, the wine doesn't wait for you to stick your nose in the glass. Heady, deep, fresh grape aromatics come at you with a little spice and no heat. 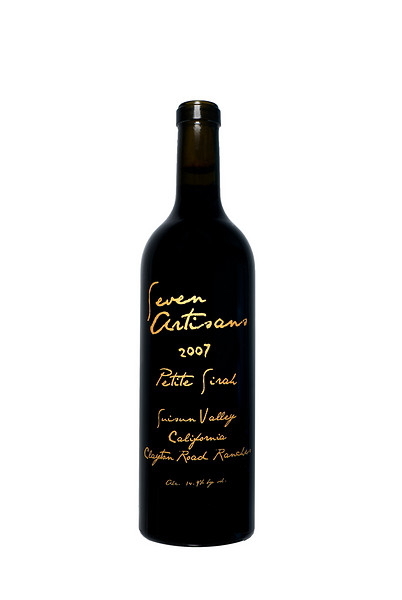 It's not quite black the way a lot of Petite Sirah is, but definitely deep, deep purple. At the cork's pull, the texture is softer than warm bath water - super smooth. Structure is definitely there, but tight and closed. Grit in the tannins and a chalk-dry finish means a time out for this kid in the decanter. A couple of hours breathing smooths out the gritty acids a bit, but the fruit remains...pretty ordinary? Overall, it might not curl your toes, but this is a winery - and region - to keep your eye on. And priced under $20, we like the value statement these guys are making. Good stuff...Thanks for the info, Roger!